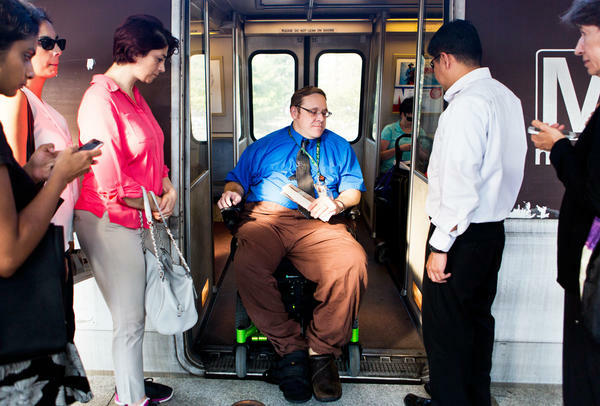 Jason Olsen, a 39-year-old policy adviser for the Department of Labor, uses the Washington, D.C., Metro to commute to work three times a week. On the other days of the week, Olsen telecommutes from home to avoid the challenge of taking the Metro. (Top left) Olsen re-enters his van to drive to an alternative Metro entrance after learning that one of the elevators is not working. (Top right) Olsen often leaves for work early to avoid crowded cars during rush hour. (Bottom) Olsen greets Metro station employee C.A. Phang at the Shady Grove Metro station. More than 60 percent of people with a disability in our poll say their job has a bad impact on their stress level. Jason Olsen says he's not surprised by the poll's findings. As I meet him at his home in Gaithersburg, Md., we start trading commuter complaints. Traffic was terrible getting here, I say. But his story wins out. "The other day I had to wait 45 minutes to finally get a train where I could get myself and the wheelchair onto the train," he says. Navigating Washington's Metro system is always a challenge, he says. And then there was the time when someone ran their luggage over his foot, breaking it in multiple places. But because a car accident left Olsen paralyzed from mid-chest down, he didn't realize his foot had been broken. Another time — a couple of weeks before our meeting — he suddenly fell ill at work. "Three hours later, I'm in the ER, and two hours later I'm in the ICU," he tells me. "Some of the stuff, you know, when you don't have the sensation, your body doesn't give a lot of warning signs." Warning signs, in this case, that might have signaled that a cut on his foot had turned into a septic infection. He was ultimately hospitalized for two weeks. Our workplace and health survey found that 62 percent of people with disabilities say their job adds to their stress level, compared with 41 percent of the nondisabled. Perhaps more stark is that over a third (35 percent) of disabled workers say their job has a bad impact on their overall health. That's more than double the rate for their nondisabled peers (15 percent). Olsen, who works on disability policy for the federal government, says it often isn't the work that's stressful, but the time, energy and physical toll it takes to get to the office, sit in a chair for hours, and manage the other demands of living with a disability. Those demands can require specialized equipment and extra time and care. For example, because he uses a catheter and other equipment, going to the bathroom can take an hour. And when he falls ill, it also affects his wife B.J. 's work schedule as an emergency room nurse, adding to the stress. "I think it's a double-edged sword," she tells me. "I want him to go and do work and stuff like that, but then because of his physical problems, it makes it harder to work." Jason Olsen's main sources of stress relief, he says, are his son, Gunnar, and baby daughter, Scottie. They keep him motivated. "Your option is to sacrifice some of your own self-care and health or to live in destitution," he says. "For me, that's not a choice." On balance, the income, independence and social contact that work provides are good for people with disabilities, says Cheryl Bates-Harris, an advocacy specialist with the National Disability Rights Network. "We have study after study that shows that for people with psychiatric disabilities, work is part of recovery, and it helps them," she says. But she can also see how it adds stress. "If you're worried about whether your performance is going to be acceptable, whether they're going to keep you beyond your probationary period, whether there's going to be opportunity for advancement, God forbid that you could request some kind of reasonable accommodation, I imagine that could be pretty stressful for people," Bates-Harris says. When considering whether to hire a disabled worker, employers worry that accommodating disabilities might cost a pretty penny. In fact, the average cost is only about $500 per person, Bates-Harris she says. Judy Owens says that persistent misconception is one reason she started Opportunity Works five years ago, helping more than 70 people with disabilities find jobs. She says it can be so hard to find jobs, some people might stick with a bad job. "You might have five other friends with disabilities who don't have jobs at all, so you just kind of deal with the bad environment you're in, because at least you have a job," Owens says. That was not the case for James Schwonek, who left his previous job in IT after his boss fell ill.
"That actually prompted me to go find a different job," he tells me, "because I didn't have the arranged accommodation that was there previously." The accommodations in his case were basic: His boss took care to face him when talking, so Schwonek could read his lips. Without the boss around, however, the workplace seemed less welcoming. Co-workers ridiculed him, he says, for trying to teach them basic sign language. His experience appears to be fairly common. According to our survey, just over a third of disabled workers say their workplace policies helped them. But more than half (55 percent) rated their workplace fair or poor in terms of providing a healthy work environment, as compared with 21 percent of the nondisabled. Still, that's progress, says Clay Bradley. He's a 51-year-old man who was born missing part of each limb. He recalls the era before the Americans with Disabilities Act, when buses often didn't come with ramps. 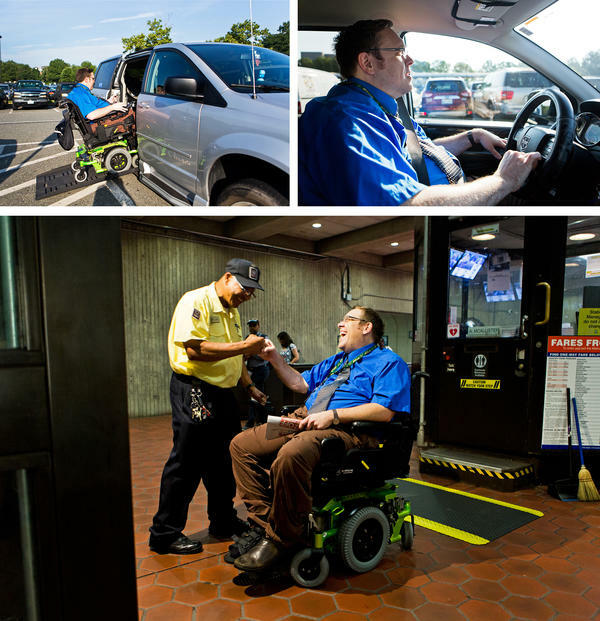 "Now buses automatically have ramps in them," he says. "When I was using buses in the '90s or in the '80s, half of them would have ramps and then half of them wouldn't. So you'd have to schedule your trips for a bus that was going to have a ramp on it." Bradley, who works in customer service at a health insurance firm, says other than a ramp, he requires no special equipment. "I use both arms and I can touch the keys individually; I make mistakes but I've used the computer so long, I correct them very quickly, so my typing speed is about 35 words per minute," he says. And once he's at work, he says, work is just as stressful for him as the next person. Many working Americans say they make a trade-off. They do their jobs, and the work affects their health. Four out of 10 people surveyed said this. Many say they face so much stress that it harms their health. The survey comes from NPR News with the Robert Wood Johnson Foundation and the Harvard T.H. Chan School of Public Health. Working people who are disabled are especially likely to say their jobs add to their stress. NPR's Yuki Noguchi has more. YUKI NOGUCHI, BYLINE: The morning I meet with Jason Olsen at his condominium in Gaithersburg, traffic is terrible. So we start trading commuter complaints. He wins. JASON OLSEN: In fact, the other day, I had to wait 45 minutes to finally get a train where I could get myself and the wheelchair onto the train. NOGUCHI: Once, someone ran their luggage over his foot, breaking it in multiple places. But because a car accident paralyzed Olsen from mid chest down, he didn't realize it. Then, just two weeks earlier, he'd fallen ill at work. J OLSEN: Three hours later, I'm at the ER. And two hours later, I'm in the ICU. Some of this stuff, you know - when you don't have the sensation, your body doesn't give you a lot of warning signs. NOGUCHI: Warning signs, in this case, that a cut on his foot had turned into a septic infection that hospitalized him for two weeks. So yes, Olsen says, it's not surprising that a study finds work adds more stress for people with disabilities. Our workplace and health survey found 62 percent of people with disabilities say their job adds to their stress level. Perhaps more stark is that over a third of disabled workers say their job has a bad impact on their overall health. That's more than double the rate for their non-disabled peers. Olsen, who works on disability policy for the federal government, says it often isn't the work that's stressful, but the time, energy and physical toll it takes to get to the office, sit in a chair for hours and manage the other demands of living with a disability, demands that require specialized equipment and extra time and care. J OLSEN: This is the roll-in shower, pretty typical, you know. NOGUCHI: Because he uses a catheter and other equipment, going to the bathroom can take an hour. When he falls ill, it even affects his wife B.J. 's work schedule as an ER nurse. B J OLSEN: I think it's a double-edged sword. I want him to go and do work and stuff like that. But then, because of his physical problems, it makes it harder to work. NOGUCHI: Jason Olsen's main source of stress relief, he says, are his son, Gunnar, and baby daughter, Scottie. J OLSEN: Who's that guy? J OLSEN: You like Darth Vader? Who's your favorite bad guy? NOGUCHI: They keep him motivated. J OLSEN: Your option is either to sacrifice some of your own self-care and health or to live in destitution. And for me, that's not a choice. NOGUCHI: Cheryl Bates-Harris is an advocacy specialist with the National Disability Rights Network. She says on balance, the income, independence, and social contact that work provides are good for people with disabilities. CHERYL BATES-HARRIS: We have study after study that shows that for people with psychiatric disabilities, work is part of recovery. And it helps them. NOGUCHI: But she can also see how it adds stress. BATES-HARRIS: If you're worried about whether your performance is going to be acceptable, whether they're going to keep you beyond your probationary period, whether there is going to be opportunity for advancement - God forbid that you should request some kind of reasonable accommodation - I imagine that could be stressful for people. NOGUCHI: Bates-Harris says employers worry accommodating disabilities might cost a pretty penny. In fact, the average cost is about $500 per person. Judy Owens says that persistent misconception is one reason she started Opportunity Works five years ago, helping more than 70 people with disabilities find jobs. She says it can be so hard to find jobs, some people might stick with a bad one. JUDY OWENS: You might have five other friends with disabilities who don't have jobs at all, so you just kind of deal with the bad environment you're in because at least you have a job. NOGUCHI: That was not the case for James Schwonek, who left his previous job in IT after his boss fell ill.
JAMES SCHWONEK: And that actually prompted me to go find a different job because I didn't have the arranged accommodation that was there previously. NOGUCHI: The accommodations in his case were basic. His boss took care to face him when talking so Schwonek could read his lips. Without the boss, the workplace seemed less welcoming. Co-workers ridiculed him for trying to teach them basic sign language. His experience appears to be fairly common. According to our survey, just over a third of disabled workers said their workplace policies helped them. But more than half rated their workplace fair or poor in terms of providing a healthy work environment. Clay Bradley says that's still progress. The 51-year-old who was born missing part of each limb recalls the era before the Americans With Disabilities Act, when buses often didn't come with ramps. CLAY BRADLEY: Now buses automatically have ramps in them. When I was using buses in the '90s or '80s, half of them would have ramps. And half of them wouldn't, you know. So you'd have to schedule your trip for a bus that was going to have a ramp on it. NOGUCHI: Bradley, who works in customer service at a health insurance firm, says other than a ramp, he requires no special equipment. BRADLEY: I use both arms, and I can touch the keys individually. I make some mistakes, but I've used computers so long I correct them very quickly. So my typing speed's about 35 words a minute. NOGUCHI: Once he's at work, he says work is just as stressful for him as the next person. Yuki Noguchi, NPR News, Washington. INSKEEP: And we'll have more about the results of our new Workplace and Health poll later today on All Things Considered from NPR News. We're going to find out how it affects your health when you fail to take vacation days. Transcript provided by NPR, Copyright NPR.